Venezuela's government has told workers and students to stay at home as the country faces a second day without electricity. Hospitals, public transport, water and other services have been affected. 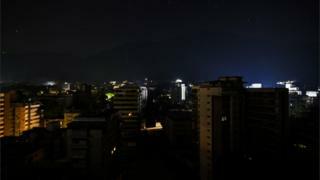 The capital, Caracas, was first plunged into darkness on Monday. Power was restored four hours later, before a second blackout struck. A days-long nationwide power cut earlier this month prompted looting and desperation in parts of the country. President Nicolás Maduro's government blames the power cuts on an "attack" by the opposition, led by Juan Guaidó. The opposition cites two decades of underinvestment and corruption by the socialist government as the cause of the power outage. "Nothing is working," Yendresca Munoz, a 34-year-old bank analyst living in Caracas told Reuters news agency. "During blackout days you can't do anything at all. There's no internet, no access to cash." Other big cities, including Barquisimeto, Maracaibo in the west of the country, have also been reportedly affected. Will the US target Venezuelan oil? On Twitter, Mr Guaidó said: "When our people need certainty in the middle of another unsettling blackout, how can they go on repeating excuses of an 'electricity war' and sabotage?" Since January, the opposition leader has been locked in a power struggle with Mr Maduro's government, which is grappling with a severe economic crisis. Last week, Mr Guaidó's chief of staff was arrested on terrorism charges in another escalation of the political crisis. Power first went down in Caracas around 13:20 (17:20 GMT) on Monday, causing chaos in the city's public transport system as the metro shut down and many thousands of people had to stream home on foot or by bus. He had gone on state TV earlier to repeat the now-familiar assertion that opposition sabotage rather than a lack of maintenance had caused the afternoon blackout, saying hackers had attacked computers at the country's main hydroelectric dam. The minister boasted that the first power cut had been fixed in "record time". Since the second outage, power has still not been restored. Because of the problems with the power supply, TV viewers could only see a garbled picture when Mr Rodríguez went live on air, a correspondent for the UK's Guardian newspaper tweeted from Caracas. Meanwhile, Brazil's mines and energy minister Bento Albuquerque said that since 7 March, Venezuela has failed to fulfil its contract to supply electricity to the northern Brazilian state of Roraima. He said Brazil was working to start building a transmission line to connect Roraima to the rest of the Brazilian power grid in the second half of the year for completion in 2021, so that it was not reliant on Venezuela. He added that Brazil would also seek public contracts for renewable energy, such as wind and solar, as another alternative to Venezuela's supply.